Where does the born- and reborn-digital material take the Digital Humanities? 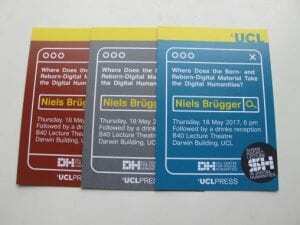 On 18 May 2017, Niels Brügger, Professor of Internet Studies and Digital Humanities at Aarhus University in Denmark, and co-editor of The Web as History, delivered the third lecture in the UCL Centre for Digital Humanities annual Susan Hockey lecture series. With a focus on archiving, the lecture investigated the different types of digital media and explored how each type can be used for scholarly purposes. Understanding the web’s function as an archive requires a grasp of its scale, yet the amount of data added to the web on any given day is difficult to fathom. Google processes over 20 petabytes of digitised data, born-digital data and reborn-digital data every 24 hours – that’s over 20 million gigabytes. But how do we archive this volume of information? How can we preserve the contents of news websites that have a shelf life of a day, or even an hour? The web is where, and how, future researchers will learn about the 21st century, and so the importance of archiving – deciding which parts of the web should be preserved, how often, and by whom – increases with every petabyte of new data. As with any collection of documents, the ways in which they are collected and curated determines how they can be used by future researchers, across the Digital Humanities and beyond. The web is the equivalent of the letters, novels and artworks of the past, yet it offers a place in history for not only the artists and writers of our time but for everyone who uses it. Anyone interested in the topic should read The Web as History, available to download for free here. showing how the discipline’s research can made relevant to a wider audience. This post originally appeared on the Global Social Media Impact Study blog. It has been re-posted with permission. 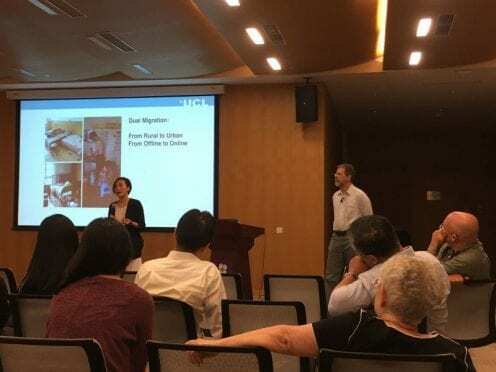 To share our findings we organised a trip to four major centres (Hong Kong, Guangzhou, Beijing, and Shanghai) and nine separate institutions. At a major anthropology and sociology department such as in Hong Kong University, Sun Ya-sen University in Guangzhou, and the Chinese Academy of Social Science in Beijing we could highlight our key point about this potential for anthropology itself in working with dynamic and shifting new media. 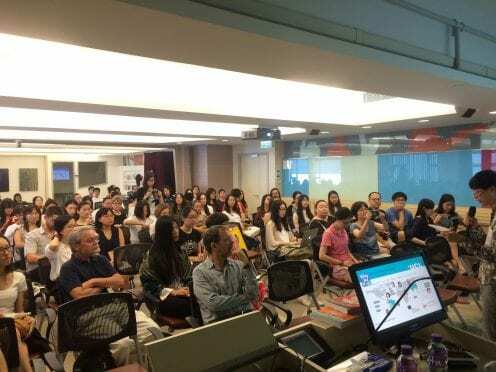 But it was equally important to talk to Communication Departments such as at the Baptist University of Hong Kong, the Chinese University of Hong Kong, and the Communication University of China in Beijing so that students in that discipline were exposed to the potentials of ethnographic fieldwork. Our audiences ranged from arts and humanities at NYU in Shanghai, to philosophy students in Fudan University of Shanghai. 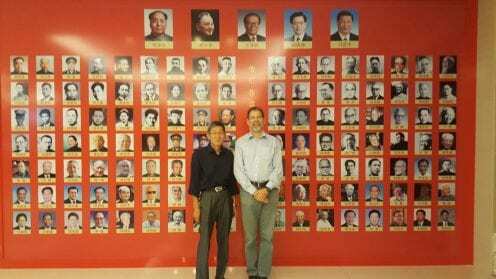 We also visited the People’s Press who had published Xinyuan’s translation of the Digital Anthropology book and where I realised that my fellow authors included both the present and all the past presidents of China. This post, by Daniel Miller, originally appeared on the Global Social Media Impact Study blog and is reposted with permission. In recent decades China has witnessed the largest ever migration in human history. By 2015 the number of Chinese people who had left rural villages to work in factories and cities had risen to 277 million. If Chinese migrant workers were the population of a country, it would be the fourth largest in the world, and they are the human faces behind ‘Made-in-China’. While ‘Made-in-China’ products have become pervasive in our daily life, the people who produce them remain mysterious; however, a new open access book Social Media in Industrial China, reveals that Chinese factory workers actually exhibit an unexpected and sophisticated use of social media to bridge the gap between their rural roots and their industrial lives. Xinyuan Wang, the author of the book, is a digital anthropologist from UCL who spent 15 months undertaking fieldwork in a small factory town in southeast China, living in one of the factories and tracking the use of social media. By studying this marginalized population, who have, in many ways, embraced the potential of social media to the fullest, this in-depth study sheds light not just on Chinese social media usage, but also on the nature of contemporary China. Hua, a factory worker in her early 30s, has a strong emotional attachment to the beautiful mountain that frames her home village. During her periods as a factory worker, she misses her home village terribly. Her account on the Chinese social media platform QQ is rich in images of her home village; she has uploaded a large number of photographs of her home village into an album called ‘homeland’ (jiaxiang). Curiously, however, when asked whether she plans to move back to her home village, Hua’s answer is always negative. As well as a lack of job opportunities there, she also feels that her exposure to modern China means that she can no longer go back to ’boring and backward’ country life. ’Sometimes, when I felt sad or deflated, I will have a look at those photos … as if I visited my homeland,’ Hua said. The homeland album is very popular among Chinese migrant workers, and most of them admitted that, even though they miss their home village, they felt unable to return after their exposure to the realities of modern China. These rural migrants are often referred to as a ‘floating population’ — the hukou (household registration) policy implemented by the government means that they are unable to create a permanent home in the city. A consequence of this is that they are constantly looking for temporary employment, unable to settle in a single place. Hukou policy divides the Chinese population into rural or urban residents dependent on their place of birth and allocates social resources accordingly, which means rural migrants are unable to enjoy the social welfare benefits that their counterparts in cities receive. Even when faced with rural-urban divide and severe social discrimination, rural migrants, especially the younger generation, still regard migrating to urban areas as the only way to participate in modern life, and rural life is seen as ‘backward’ and ‘boring’. In this situation, people’s attitude towards their homeland is very ambiguous. ‘Home village is a place you always miss, but not really a place you want to return to,’ as Hua said. Like Hua, many rural migrants see their home village more as a spiritual comfort than a practical option. On social media, all the bad memories and negative associations of village life and homeland seemed to be expunged, leaving only ideal, purified images that give people comfort. They may not be physically in the villages of their origin but, wherever the floating rural migrants are, they take their homeland with them. However, homeland is not the only place that is rebuilt on social media. To many, social media is also where they actually live, as Xinyuan argues in her book. Lily, a 19-year-old factory girl, spends almost every single waking hour on QQ when she is working on the factory assembly line. Lily’s QQ profile is a stylish, curated space with lots of beautiful photos and pop music that she has collected online. Online, Lily is popular and she talks as if she were a princess who is waiting for true love: “In my life I have always dreamt about my true love. He will treat me very well, protect me from all the uncertainty, displacement, sadness, and loneliness. However, I always know that that person will never turn up.” However, Lily never talks in this manner offline. Lily lives with her parents and younger brother and sister in a small factory town. They live in two small single rooms without heating, hot water or air conditioning; they share the only toilet with two other rural migrant families. In summer, when indoor temperatures regularly pass 38°C, the family wash themselves in the shared bathroom; a plastic bucket and washbasin function as a shower. The walls are heavily stained, and there is soiled toilet paper and stagnant water on the floor. In winter, when temperatures fall below freezing, the family head to a nearby public bath to shower once a week. One day after work Lily was ‘working with’ her QQ via a smartphone, a Huawei model that she had purchased for 1,850 RMB (US$308). Captivated and absorbed by her ‘online world’, she eventually looked up and saw Xinyuan. ‘Life outside the mobile phone is unbearable, huh?’ Lily observed. Lily’s insight forced Xinyuan to address the question that became central to her work in industrial China: where do people live? In this small factory town, Xinyuan has met many young rural migrants who have moved geographically closer to a modern China, but it appears that it is only online that they actually arrive there. For many migrant workers, social media has become the place where they can visualise and, in a way, achieve their aspiration towards modernity. On a wider scale, Xinyuan’s study witnessed not just rural-urban migration, but also a parallel migration from offline to online. The study demonstrates the need to understand where people live, without assuming that the offline is necessarily more ‘real’ or more material. Whilst people in the West have become concerned about the authenticity of social connections on social media, for some migrant workers the situation is the opposite — it is online where they have found the most genuine relationships, even with strangers. The story of Feige, a 37-year-old forklift truck driver, presents a typical example. Feige is a member of 15 QQ groups, though he only actively participates in three. Members of these groups are, on the whole, factory workers with backgrounds similar to Feige’s. Though he had never met the members of these groups offline, they seemed to know much more about him than his colleagues. Feige is extremely popular amongst his online friends. Members of the groups have great affection for him, finding him funny and smart, and always asking for his opinions on social events and news. ‘They [online friends] like me and talk with me because they really like me, not because I am rich so that they can borrow money from me, or I am powerful so that they can get a job from me. Here everything is much purer, without power and money involved,’ Feige explained. Feige regards his online friendships as ‘purer’ (geng chun) than his offline relationships, as online there are no pragmatic concerns involved. That friendship on social media has been valued highly by Feige is not rare among rural migrants; for migrant workers such as him, who are often frustrated by their social status, social media provides new possibilities of sociality free from social hierarchy and discrimination. It is on social media where Chinese migrant workers have experienced a real sense of ‘friendship’; in offline situations, kinship and regional relationships, such as between fellow villagers, are dominant. It is interesting to note that, rather than being the threat to privacy that many in the Western world perceive, social media has actually increased the experience of privacy for most migrant workers. In an environment where offline private space is usually limited, and any effort of avoiding the public gaze can be misinterpreted and stigmatized as an attempt to cover something shameful, the online world offers people much needed personal space and freedom. 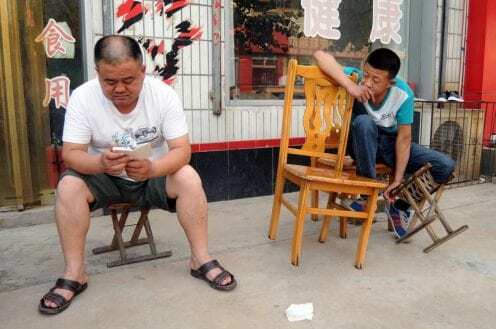 The stories of Lily and Feige are just two examples from Social Media in Industrial China; Xinyuan’s field work provides many more absorbing accounts of how social media impacts the lives of rural migrants. 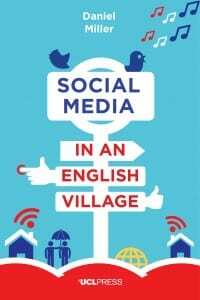 Using these real-life tales as a basis, the book illustrates the social media landscape in China and explores the impact of social media on people’s lives. From personal development, social relationships, gender and education, to commerce, privacy, ancestor and deity worshipping and political participation, many of Xinyuan’s discoveries challenge the West’s perception of both China and its inhabitants, explaining why it is time to reassess exactly what we think we know about China and the evolving role of social media. Xinyuan Wang is a PhD candidate at the Dept. of Anthropology at UCL. She obtained her MSc from the UCL’s Digital Anthropology Programme. She is an artist in Chinese traditional painting and calligraphy. She translated (Horst and Miller Eds.) 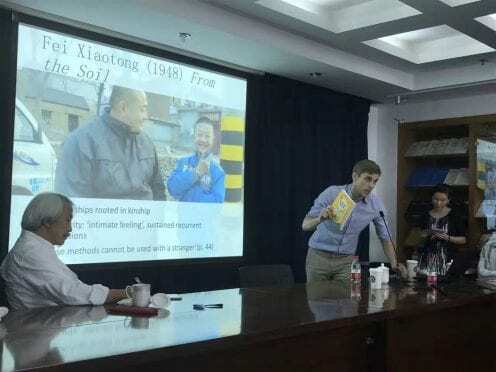 Digital Anthropology into Chinese and contributed a piece on Digital Anthropology in China. A fuller version of this piece appeared on Medium. If you like what you’ve just read, then we’d recommend that you download Social Media in Industrial China by Xinyuan Wang which is available to download for free here. Today’s guest post is written by Ralph Schroder and Niels Brugger, authors of the forthcoming UCL Press book The Web as History: Using Web Archives to Understand the Past and the Present. The World Wide Web has now been with us for more than twenty years. From its early incarnation as the Mosaic browser, to today’s ubiquitous uses of the Web as a source of information, entertainment, and much else, the Web has become part of our daily lives. It is therefore curious that scholars have thus far made little use of the Web as a source for understanding historical patterns of culture and society. Future historians and social scientists are bound to look to the Web, its content and structure, to understand how society was changing – just as they have used letters, novels, newspapers, radio and television programmes, and other artefacts as a record of the past in pre-digital times. What can we learn from the Web so far? Our forthcoming book, an edited volume entitled The Web as History: Using Web Archives to Understand the Past and the Present (eds. Niels Brügger & Ralph Schroeder) will present a series of chapters about how culture and society has evolved with the Web. It will include a number of histories of national Web spaces, accounts of different domains such as government and media websites, and case studies of topics such as religion, and education, the online community of GeoCities, and the evolution of the abortion debate in Australia 2005-2015. We believe that Open Access is a good policy: it has been shown to increase audience reach and access. Our book can also have plenty of images – pictures of websites: very important, for obvious reasons, in this case. Our book is about the Web, and will have a diverse readership, who can hopefully also find it easily online. 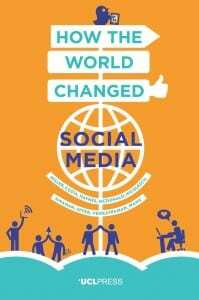 UCL Press has published an impressive set of books in internet research, especially How the World Changed Social Media, and other books in the Why We Post series by Daniel Miller and colleagues. The fact that the book can be both in print and online is the best of both worlds. Finally, they have a helpful team, good to work with! Ralph Schroeder is MSc Course Director and Senior Research Fellow at the Oxford Internet Institute. Niels Brugger is Professor in Internet Studies and Digital Humanities at Aarhus University, Head of NetLab, part of the Danish Digital Humanities Lab, and head of the Centre for Internet Studies. Their book, The Web as History, will be published by UCL Press in spring 2017. Today’s guest blog is by Edward King, Lecturer in Portuguese and Lusophone Studies at the University of Bristol. His book, Technology, Posthumanism and the Graphic Novel in Latin America will publish in 2017. Technology, Posthumanism and the Graphic Novel in Latin America will be the first book-length study of the graphic novel form in the region. Latin America is currently experiencing a boom in graphic novels that are very sophisticated, both in the concepts they are exploring and in the way they are reworking the genre. We believe that the graphic novel is emerging in Latin America and elsewhere as a uniquely powerful medium through which to explore the nature of twenty-first century subjectivity and especially forms of embodiment or mediatization that bind humans to their non-human environment. These can be very productively drawn out in relation to modes of posthuman thought and experience, and that is the focus of our book. We discuss a range of recent graphic novels from Argentina, Brazil, Chile, Mexico and Uruguay, all of which experiment in exciting ways with transmediality, the topological representation of space in the city, or embodied modes of perception and cognition. They are often concerned with finding a new form of ethics for a posthuman world in which agency is both dispersed beyond the human self and (paradoxically) rooted in the materiality of an embodied existence. Publishing open access with UCL Press will enable us to distribute our research much more effectively. The community of scholars interested in Latin American culture, graphic fiction and the study of posthuman subjectivities is geographically extremely dispersed so being able to download the book from the internet should be a great help. Researchers and students in Latin America often find the cost of importing books prohibitive, so the open access route will allow us to establish a much closer dialogue with them. Furthermore, as our focus in the book is on texts that intersect with the technologies of the information age in a number of ways, it is appropriate that it bestrides both print and digital media. Edward King is a Lecturer in Portuguese and Lusophone Studies at the University of Bristol. He is the author of Science Fiction and Digital Technologies in Argentine and Brazilian Culture (Palgrave Macmillan, 2013) and Virtual Orientalism in Brazilian Culture (Palgrave Macmillan, 2015). UCL Press will publis his forthcoming book (co-authored with Joanna Page) Technology, Posthumanism and the Graphic Novel in Latin America in 2017. Sign up for more details here. 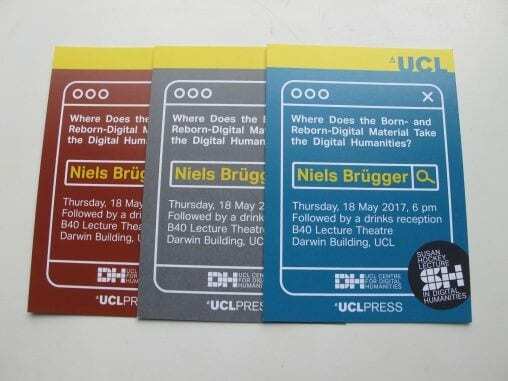 For our particular project, Why We Post, the creation of UCL Press was simply the perfect answer to a key question. We had already committed to open access. This is something I am personally very committed to and had previously published a paper advocating open access in an anthropology journal. I was very disappointed with the current models of Green and Gold and wanted what I think of as genuine open access, which inevitably means publication being taken back into the university system and thereby saving huge sums for libraries. I feel this strongly as anthropologist since we need to make our findings accessible to low-income people in low-income countries which are the populations that we typically study. The additional headache was that we were committed to publishing 11 books. Having carried out nine different 15-month ethnographies we knew we had a vast amount of important new material about the use and consequences of social media, a topic of huge public interest. For us open access also means writing in an open and accessible style. But taking on 11 volumes is quite a commitment. So we needed a press with vision and ambition. At this point we could not be happier with the result. We launched the first three books at the end of February and within a month we had over 10,000 downloads, which is almost unimaginable in traditional publishing. As people who work on digital technologies it’s great to see online books with hyperlinked chapters and endnotes that we can link to directly from our free FutureLearn e-learning course and our Why We Post website. In addition, a topic such as social media is about the rise of visual communication and it was essential for us to have many colour images included. We feel we have been supported throughout this adventure by UCL Press, especially with regard to advertising and marketing. I have published 37 volumes and was particularly impressed by the fast turnaround from submission of final manuscripts. We are happy that there are also relatively inexpensive offline paperbacks for those who prefer physical books. But if I was to pick out one particular achievement which matters to an anthropologist it is that our books are being read in 132 countries with over 100 downloads recorded for countries as diverse as Turkey, Russia, Poland, Japan and Mexico. This post by Laura Haapio Kirk originally appeared on the Global Social media Project blog on 14th March. It has been reposted with permission; statistics have been updated. Since our launch on the 29th February, the first three open access books in the Why We Post series have been downloaded over 10,000 times! 10,000 downloads in just a month makes for a very happy team. The entire series of 11 volumes will continue to be released by UCL Press over the coming year, so keep your eyes peeled. Australian Financial review (9/3/2016 online): Is social media all about narcissism? Inside Marketing (online) Perché postiamo sui social?